More Canadians than ever are living the dream of the full-time cottage lifestyle. The slower pace and serenity of nature hold a lot of appeal. It’s a growing trend amongst people looking to spend their retirement, or semi-retirement, in a calming and peaceful location. This lifestyle change, just like your cottage renovation, should be about creating more joy. For retired or semi-retired cottagers, this is especially important. More free time will be dedicated to hobbies and activities. So you will need the cottage to match those needs. It’s not just those entering retirement making the move to cottage living either. The ability to work from home has become common enough to allow more people to move away from city-life. 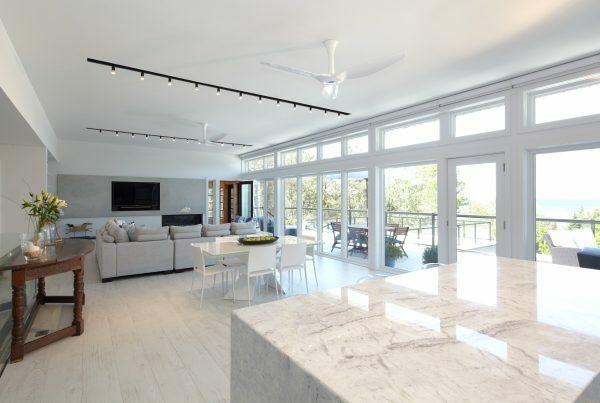 In this article, we delve into some of the considerations to keep in mind when renovating your cottage for full-time living. Location will factor into a lot of your needs. If the cottage is more isolated, like on an island or far from the nearest town, you will need to consider food storage. You likely don’t want to make the long trips to the store frequently. So a large pantry and cold storage can reduce your trips for groceries. The type of terrain can affect what sort of installations you can benefit from. 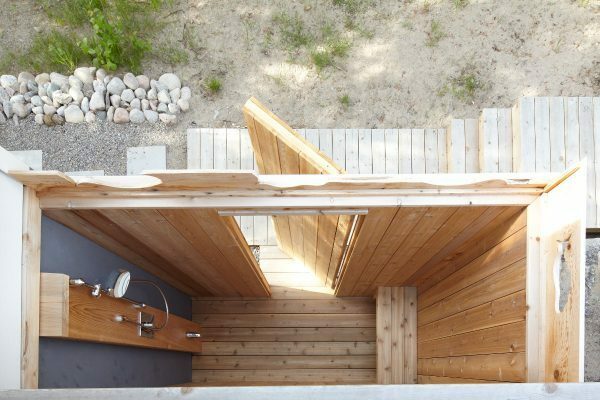 For example, in this cottage renovation, an outdoor shower was added. This kept the home clean by allowing guests to wash off sand from the beach before coming inside. Location also may affect what you can do with your renovation. If the cottage is built on rock this can limit your building options. The ability to access your location is also an important factor. Can equipment and materials be brought in from the road or will it have to come by barge? If there is no access for large equipment your renovation options may be more limited. We would recommend a backup generator for any cottage. But it is especially important for cottages in isolated locations. The more isolated you are, the more important it becomes. A generator doesn’t just keep the lights on. It’s your lifeline keeping the well, septic, and heat running. As well as keeping your food supplies from spoiling. A whole home generator is your best option. And the best time to add it in is during the renovation or build. This way space is properly planned for it, and it is connected to the gas line. Seasonality is another big consideration. Most cottages in Ontario are built for three seasons. If you plan on wintering abroad, such as on Florida’s sunny beaches, this won’t be an issue. But, for those hoping to stay year round, it’s important to make sure your cottage is ready for all four seasons. Winterizing the cottage can be a big task. If insulation was not part of the initial build walls, ceilings and floors will need to be insulated. In many cases, especially family built cottages, the existing walls may not be wide enough to support installation. That means that they’ll have to be expanded to accommodate insulation, resulting in less interior space. Because of these factors, insulation can be a big expense. Consider whether the whole cottage needs insulation. In some cases, doing a complete new build may be the better option. Fortunately, insulating during a build is much more cost effective than post-build. Most modern cottages are built fully winterized. The cost of winterizing on a new build is fairly low and it pays off in resale value. If you are planning a new build, winterizing should absolutely be part of the conversation. Will you be entertaining guests in the winter? Most cottage visits occur in the summer. If guest visits are infrequent over winter you may want to reconsider your guest bedroom plans. When they aren’t being used, extra bedrooms use up valuable space and are costly to heat. If visits are mostly limited to the warm months, one room bunkies can be a great option. If they are small enough – under 100 ft2 – they don’t even require a permit. They offer guests a comfortable and private space. In the winter they can be closed off and used for storage. There are options for those who expect winter guests as well. Putting the guest bedrooms on a separate floor can be a good solution. When guests are not present that floor can be sealed off so you aren’t paying to heat unused rooms. Keeping them on a separate floor also keeps the guest rooms out of the way. So you can use your space as normal, even when the guest rooms are closed off. Winter is not the only season to prepare for. Is your cottage ready to deal with high volumes of bugs and insects in the spring? Thick clouds of black flies and mosquitoes limit your enjoyment of the cottage if you do not prepare for them. One important aspect of pest management is making sure your cottage is properly sealed. This will help keep bugs, insects, spiders, and rodents out. During the buggy spring season, you’ll be especially happy to have done this. A screen porch or sunroom can also allow you to enjoy the sun and nature in peace. All without having to deal with bites and stings. Planning ahead for pests will help you enjoy your cottage in all seasons. There are definite challenges to living in cottage country. Awareness and preparedness are the keys to overcoming these challenges. Here are a few to consider. Heat, power, water, and internet are necessities for year-round cottage living. If you are far from town you will likely rely on satellite for internet and television. Power may come at a higher cost if you are far from the source. As a result, you will want to make sure your cottage is efficient to minimize electricity costs. It‘s important to be aware of the emergency services available to you. Fire, medical, and police services may not be able to offer prompt service. For fire, this can also mean added costs as it will raise your fire insurance rates. Look into whether there is a local fire hall. If you rely on a volunteer fire station, make sure it runs year round. Medical services may not have quick access. If you are at risk or require frequent health services make sure you are close to a hospital and accessible by ambulance. The more isolated you are, the longer the delay before you can receive care. The last thing you want is to be stranded by a snowfall. Does your cottage have snow removal services available? If not, you will be reliant on a plow or snowblower. These become added considerations for storage. Many cottagers use living space to store their summer equipment throughout the winter. If you are living in the cottage full-time, you need this space. So you will need to consider adding storage space. You should consider storage for your vehicles as well. Having a safe space to park vehicles protects them from theft and environmental damage. Jetskis, ATVs, and Snowmobiles are frequently stolen from cottages. Having secure storage can save you a lot of money and hassle. This is one of the biggest elements to consider. Can you handle the isolation? For those used to city life, this is a big adjustment. In the summertime, there may be lots of people around, and even some social clubs in the nearby town. But in the offseason are you prepared for the isolation of cottage life? It’s important to plan your cottage renovation around activities and hobbies. A boathouse can set you up for fishing, boating, and water activities in the summer. In the winter having a place for ice fishing, cross-country skiing and snowshoeing keeps you healthy and entertained. You may even want to consider dedicating some space to indoor hobbies for when the weather is uncooperative. An indoor gym space can help here. Making your cottage your full-time home is absolutely an attainable dream. With strong interior design and proper planning, you do not have to sacrifice the comforts of home for cottage life. Start your planning today and get ready for the transition to a blissful cottage lifestyle.